Our Sunday School teachers likened us to Neo, being awakened into our True Spiritual Identity — if only we could recognize it we too could move mountains (I’m fairly sure they meant this figuratively because to the best of my knowledge none of them ever managed such a feat, and mountains aren’t real because none of this existence is real, but I digress). I agree, in many ways, Christian Science is like The Matrix: this is all the Adam Dream and any day now we’ll wake up and rediscover our True Spiritual Selves. Come to think of it, Christian Science is exactly like the Matrix, but not in the way Christian Scientists would like you to think. In The Matrix, “reality” as projected by the Machines is used to subjugate the humans (the science and logic involved in this is vague and sketchy at best). When Neo “wakes up” he realizes there is the Real World, outside the Matrix, beyond the control of the Machines. The machines remain an ever-present threat, sort of like Ms. Eddy’s baddies-of-choice Error, Mortal Mind and Malicious Animal Magnetism. I don’t think Ms. Eddy ever set out to subjugate humanity, but I do feel her misguided teachings have done more harm than the Matrix’s less-than-benevolent overlords. In the Matrix, the humans are totally unaware of the fact they are being subjugated, manipulated and deceived. The Matrix is a dull, but mostly safe, place to be as long as you don’t question authority. In both the Matrix, and in Christian Science, the people are aware of something else, something bigger, something more. Neo is one of those who is seeking the “something more” and while his story is interesting, I am more interested in the Christian Scientists and their paths. Some Christian Scientists take the need to find “something more” as a sign they should immerse themselves in “the books” and spend hours analyzing Ms. Eddy’s works, others leave Christian Science to “find Jesus” or take another path entirely. I’m not going to critique those who have “found Jesus” – they seem happy on their path. I’m one of those who has taken another path entirely. In some ways, I feel a bit like Neo (but not badly dressed, pale and badly acted part), I’m waking up to the Real World — not the fantasy world of the Christian Science Matrix. Christian Scientists are encouraged to “live in the Absolute” but until you have ascended into Heaven and are as the Angels you’d better take care of the material body, regardless of how “unreal” you find it to be. Ignoring physical ailments will not magically make them go away — except when it does, and that’s not the “power of prayer” that’s the resilience of the human body and we are very resilient. Ms. Eddy’s “reality” calls for dissociation, varying from mild detachment from immediate surroundings (a TV commercial for pharmaceuticals) to more severe detachment from physical (everything from strokes and heart attacks, to something milder like headaches and hangnails) and emotional experience (the death of a loved one). 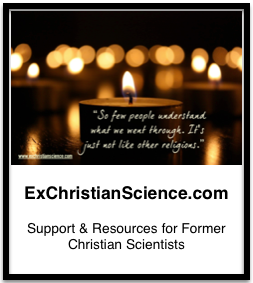 Fellow former-CS-blogger MKHuggins has two excellent pieces on this: Christian Science and Dissociation in which she argues, quite convincingly, that Christian Science is a dissociative disorder, and a follow up piece entitled Christian Science is a Dissociative Disorder Part 2. I remember young women at Principia who struggled month after month with horrible menstrual cramps, curled up in their beds with a heating pad for comfort (if they were lucky). Why allow a heating pad but not ibuprofen, or hormonal remedies? Why force otherwise healthy, capable young women to miss day after day of classes because they had been rendered nearly non-functional from pain? In Ms. Eddy’s Christian Science Matrix, the women were suffering from a false belief, in The Real World these women likely had ovarian cysts, hormonal imbalances, or other untreated issues. Could these young women seek treatment? No. That would be acknowledging and empowering Mortal Mind, Error, Mortality and Death. I know from personal experience is only so much one can disassociate from before reality peeks in. Christian Science damages the ability to have empathy for the sick or injured — they should be working on their demonstration, not laying in bed hallucinating from a fever! The ailment is not real, it is attention seeking behavior! Breaking free of Ms. Eddy’s Christian Science Matrix means learning about emotions — it is OKAY to be upset, to be angry, to be afraid, to be nervous. It is OKAY to acknowledge (and treat) physical ailments. I don’t have to be constantly filled up full with thoughts from God, and that’s OKAY. The Christian Science Matrix talks a lot about the nature of reality, how we are all spiritual ideals, lofty thoughts for sure, but I’m not seeking perfection or an otherworldly lack of need for food — I don’t need to ascend into some exalted unreal spiritual state, I’m seeking okay-ness, I’m seeking to be a better mother, wife, friend, person. I don’t need the layers of “reality” that are layered on by the Christian Science Matrix, I can fend for myself in the Real World just fine. The fate vs. freewill discussion always fascinated me, it was one of the few discussions I enjoyed in my high school English class, and I was quite curious how it applied to Biblical lore: Adam and Eve had a choice to disobey God – I always found that poorly planned on God’s part, but that is a post for a different day. I was an inquisitive child. My father encouraged my questioning and actively encouraged me to read and question, particularly when it came to religious matters. I was given free reign to read whatever I could get my hands on, and took similar liberties with my parents collection of records. For whatever reason my father had the 4-record set of Jesus Christ Superstar which I listened to (loudly) in the living room until my parents got me the two-CD set so I could listen to it in my room and not disrupt the entire house. Being the Good Little Sunday School attendee that I was, I was reasonably versed in the Jesus story: the Old Testament tales that foretold of his coming, the virgin birth (which still makes me uncomfortable), his mission, healing, teaching and the last supper, betrayal, crucifixion and resurrection. Questions in Sunday School where all the grades are in one big, echoing room, are dangerous things, particularly when I was the one asking them. So when a 1970s rock-opera made me question the official Jesus story my Sunday School teachers were less than thrilled. Did Jesus have a choice? Is Jesus simply a very inspired man? Is Jesus actually God in human form? If Jesus did not have a choice, what does that say about God’s need for a human sacrifice, and God’s role as loving Mother/Father? If Jesus did not have a choice then what about us? Do we truly have free-will or is everything ore-ordained by some Divine plan? If this is all simply the “Adam dream” as Ms. Eddy refers to it, than what does it matter? Jesus was no more real than the table we were sitting around, and it is all an allegorical story. The line of questioning about Man/God and fate vs. free will usually caused the Sunday School teachers to panic and have the Sunday School Superintendent come over to “talk” with me about the need to “stay on topic.” On topic meant whatever was in that week’s Bible Lesson, or worse, going over the 10 commandments again. I was rather upset, in my secular English lit classes we could talk about Fate vs. Freewill in the context of literature, why was it frowned upon in my Sunday School class where we were supposed to be learning about the Nature of and our relationship with the Omnipotent Mother/Father God? Occasionally one would say something about the need to “fulfill the prophecy” or that JC needed to “die to prove that death was an illusion.” Prophecy fulfillment brings back the free-will/predetermined issues, and “death is an illusion” doesn’t really answer the question. I agree, nothing is lost when we die, our energy remains, albeit in a very disorganized form, but “death is an illusion” is side-stepping the question. 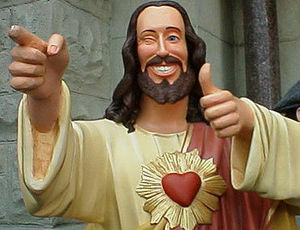 If you’re using Jesus’ death and resurrection as one of the key features of a religion I think it makes a difference.